Cassandra Gauthier has three degrees, two businesses and one house she’d like to flip, and she’s still trying to decide what’s next. LEWISTON — There’s busy and then there’s Cassandra Gauthier busy. Gauthier, 32, bought Fran’s Restaurant in late 2016, quickly putting in 40 to 50 hours a week at the friendly, relaxed diner. 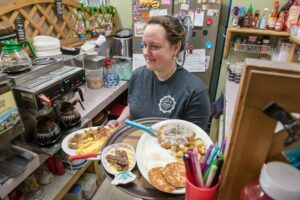 Last November, she started a second business, Household Hygienators, initially with a partner, now solo, that has her doing some cleaning and lots of organizing for 10 to 20 hours a week. Last week, she made an offer on a house to flip. In her spare time. Gauthier participated in the Future Business Leaders of America for all four years at Oak Hill High School in Wales, knowing she wanted to do something business-related but unsure what. She served in the Army, doing a tour in Iraq. She’s worked in retail, at restaurants, in disc golf, at an assisted living center, at a sober living house, for an excavation company, at an Italian sandwich shop and at Goodwill. She flipped a home with her father in 2016, using the profits from that to help buy Fran’s when a friend was looking to sell. Gauthier had worked there sporadically, as-needed, for several years. She’d fallen in love with the longtime staff. “I just felt something (after hearing it was for sale) and I knew I had to do something about that,” Gauthier said. The Androscoggin Valley Council of Governments was instrumental, she said, helping with financing and a business plan after three bank rejections. 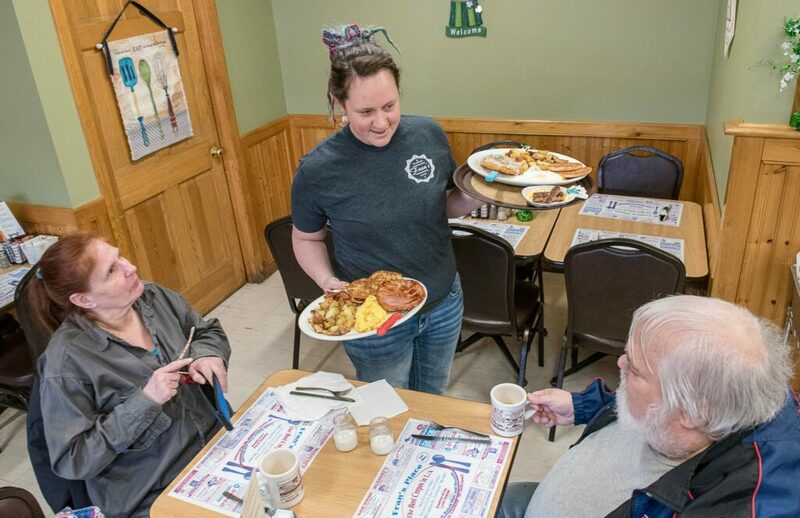 She became the fourth female owner since the original Fran opened the diner in the 1990s. Gauthier said she added paid vacation and sick days as soon as she took over. She’s also using it as a platform to help the environment, getting rid of straws, switching to paper takeout bags and designing a new kids menu with a tree-shaped word search of things that can be recycled: Aluminum, ink, leaves. During the week, she’s a server. On weekends, she mingles with customers and gives herself her favorite job there: Dishwasher. Gauthier has associate degrees in residential building construction, business management and general studies, with credits toward a bachelor’s degree in drug addiction counseling. She sees all of the work and school as being a mix of curious and restless. “I still don’t know what I want to do,” she said. Except, maybe taking it a little easier, someday. “I’ve been trying and failing hard at making ‘Me Mondays’ — one day off a week,” Gauthier said. Working is a recurring Sun Journal feature that profiles people on the job in the community. If you have someone you’d like to suggest, contact writer Kathryn Skelton at [email protected] or 689-2844.